ผมกินข้าวเช้าแล้ว pŏm gin kâao-cháao léaw. He has gone back to Australia already. They booked the table already. We bought a plane ticket already. I haven’t had breakfast already. He hasn’t gone back to Australia. They haven’t booked the table. We haven’t bought a plane ticket. It is used to ask questions to learn whether one has done something yet. Someone + do something + rúe yang? / yang? คุณกินข้าวเช้ารึยัง kun gin kâao-cháao rúe yang? คุณเจอเค้ารึยัง kun jer káo rúe yang? Has he gone to work yet? เค้าไปทำงานรึยัง káo bpai tam-ngaan rúe yang? 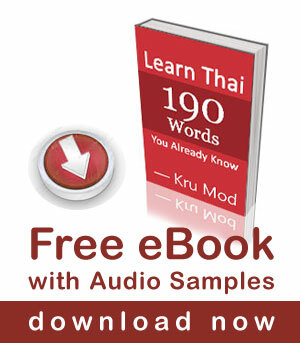 Hi Mod; a bit like Gerry; I learned Thai many years ago and have decided it’s time to re-kindle my interest. I note you use the pronoun เค้า (he / she) instead of เขา. Now I haven’t been through all your lessons yet so may have missed something; but is there any particular reason you would use เค้า instead of เขา? Thanks for your online material – wished that had been around when I was learning; much more fun than the old “type written” xerox copies I learned from. A very clear explanation, thanks you. When I had some Thai lessons many years ago, I think I was told that you just say yang for not yet. So for “pŏm yang-mâi gin kâao krab” could you just say “yang krab,” or would that be totally wrong?